There’ve been several stories this week noting the 25th anniversary of Bill Buckner’s infamous missed ground ball in Game 6 of the 1986 World Series. The miscue by the Boston Red Sox first baseman on a weak grounder off the bat of Mookie Wilson allowed the New York Mets to score with two out in the bottom of the 10th inning and take a 6-5 win, keeping the Red Sox from their first world championship since 1918. Two nights later, the Mets rallied to beat the Red Sox, 8-5, to take the Series, forever lumping Buckner alongside the likes of Fred Merkle, Mickey Owen, Ralph Branca and Mitch Williams. Labeling Buckner as one of baseball’s greatest goats has always seemed one of sport’s great injustices. For one thing, by the time he retired in 1990, he’d amassed 2,715 hits over a 22-year career that included a National League batting title. Beyond that, Buckner was far from the only reason the Sox lost the ’86 series. Red Sox reliever Calvin Schiraldi blew a 3-2 lead in the eighth inning of Game 6 and then gave up three straight hits in the 10th inning to allow the Mets’ tying and winning runs to reach base. In addition, misplays by second baseman Marty Barrett and right fielder Dwight Evans led to two Mets runs in the fifth inning. And, of course, the Sox blew a 3-0 lead in Game 7 as the Mets went on to take the Series. But for all Buckner’s feats, good and bad, the thing that will always stick in my mind was watching him hobble around bases at Fenway Park a few years later, in the twilight of his career. The Red Sox had brought Buckner back in 1990, even though he was a 40-year old with bad legs. Yet on April 25, 1990, during the fourth inning of a game against the California Angels, he lined a pitch from Kirk McCaskill over the head of rightfielder Claudell Washington and took off. Washington turned and sprinted toward the right field corner. The ball caromed off the fence and bounced back toward right centerfield just before Washington got to it, but Washington was unable to slow up in time. He ran into the low fence, which was about three feet high, and flipped over it and into the grandstands. By the time the ball had been retrieved, Buckner had circled the bases, albeit in excruciatingly slow fashion. The smile on Buckner’s face after the game lit up the Red Sox locker room. When asked the last time he’d hit an inside-the-park homer, Buckner said he thought it was in high school. Indeed, it was not only the lone inside-the-park home run of his professional career; it was the last round tripper he would ever hit in the big leagues. Buckner was released by the Red Sox a little more than a month later, ending his Major League career. Thanks to Red Sox titles in 2004 and 2007, any grudge Sox fans might have held against Buckner for the Game 6 error have largely been forgotten, though Buckner believes it was the media who stirred the pot much more than the fans. But despite the fact that one misplayed ground ball largely overshadowed a fine career and, to some degree, a fine life, Buckner never lost his composure or his faith in God. He’s come to terms with his role in baseball history, unfair though it may be. And to this day, of the more than 200 Major League games I’ve attended over the past 40 years, Buckner’s round tripper – perhaps the slowest inside-the-park homer ever hit in the Majors – remains the only one of its kind I’ve ever witnessed. 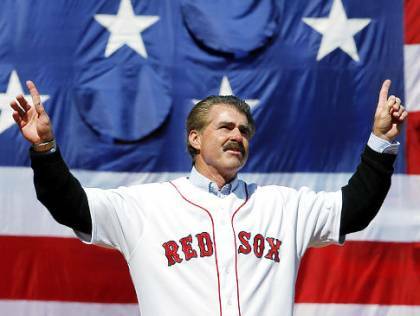 It’s the kind of remembrance that a quality man like Bill Buckner deserves.